From joy to sadness and back again… and again. Seems there have been a lot of experiences lately that remind us how fragile life is. And also, how beautiful. Balancing between the pain and joy is the messy part… the living we are all blessed to experience. Welcome to Colors of Courage! Last week Hope Scarves hosted our signature fundraiser, Colors of Courage. A small event that started in my friend Lauren’s backyard 6 years ago. Now, it has grown to fill an entire airplane hangar. 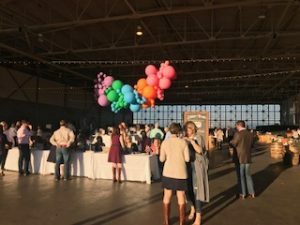 525+ people joined us to celebrate hope and raise money for scarves, stories and research. 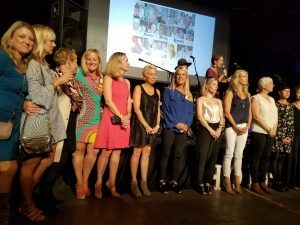 I was overwhelmed by the connections – friends re-uniting, survivors laughing and crying together as they found common ground in their shared experiences. Riley, a 20 year old UK student and scarf recipient who faces brain cancer shared her story for the first time. She spoke with confident, trembling hands about how much it meant to receive a Hope Scarf and the strength it brought her. Kendall, also a UK grad-25 years Riley’s senior – shared her story facing metastatic breast cancer. Surrounded by 30+ college friends there to surprise her with their support. When Kendall finished speaking Riley was the first person to stand and applaud. Their following embrace brought all those around them to tears. These connections and stories – so much bigger than me or Hope Scarves. Yet, they are Hope Scarves. This is what the sisterhood of the traveling scarves is. Connection. Hope. Support. We raised $54,000 in 10 minutes for metastatic breast cancer research. Overall we raised over $165,000 to support Hope Scarves. The most ever for this annual event. Women who have been supported by Hope Scarves gathered by the stage. Each scarf has a story – and we have a shared story together. Then, on Monday we awoke to the news of the worst mass shooting in US history at a concert in Las Vegas. Our joyful hearts, broken. As I watched the news in tears… exhausted from a busy weekend. I also allowed myself to give in to the pain in my right hip. For the past month I had quietly been dealing with shooting pain, terrified the deep ache was a sign of progression in my bones I was determined to push through it until after Colors of Courage. But, I couldn’t deny it any longer and as I watched the horrible events unfold in Las Vegas I thought about how our happy world could also come crashing down with news of cancer progression. I scheduled an MRI. And I tried to put it out of my mind. I busied myself with Hope Scarves. I worked with Friends of Hope Scarves to pack up event supplies, I started on a long list of thank you letters. I went to a meeting with a potential partner to share Hope Scarves and discuss opportunities to work together. I was surprised to see an old friend there, now connected to the company. I paused in my remembering of the time our path first crossed… before metastatic breast cancer. I shared our program and my personal story. All the time wondering if a new scary chapter was about to start. Shifting uncomfortably in my chair to ease the throbbing, the kind hearted president and I talked about the goals for Hope Scarves and challenges we face. Then he handed me a check for $100,000 and humbly said he hoped it would help. I was so overcome with emotions. Tears fell onto the board room table – tears of joy and gratitude. Hope Scarves has never received a donation of this size. After our meeting I slowly limped to my car in shock. Hours later I was laying in an MRI tube. After careful examination by my doctors and ugly tears on my part over the weekend (in between soccer games and horse races) I found out this morning that my pain is a stress fracture in my femur. Not cancer progression! Who would have thought a stress fracture in your femur was good news. (People living with bone mets get it.) . Thankfully, the fracture isn’t caused by a metastatic tumor, but it is concerning that my bones are weak. My lack of estrogen (due to not having ovaries) and the environment caused by my medication puts me at risk for fracture. But, we can address this – I can step up my efforts to strengthen my bones. And, I can lay off the running for a little while… (ugh.) Of course, this weekend is the Bourbon Chase and I am supposed to run 13 of our 200 miles for team Outrunning Cancer… (Don’t worry mom & dad, I’m not going to run). I’m hoping to walk 3 miles or so… outwalking cancer… UGH. I hate it. I hate that cancer has taken this experience from me and made my body weak. My body has betrayed me. I have been advised to not put weight on my right leg for 4-6 weeks to allow it to heal. I have to use crutches. I’m no good at slowing down. 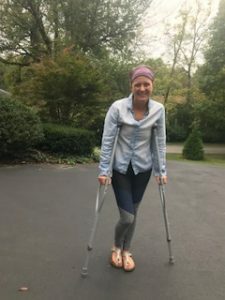 The idea of hobbling around on crutches infuriates me. But, I am aware of a much bigger picture. I think about the 58 people who were enjoying a concert until their lives were violently ended. I think about my friends who are facing horrific pain and debilitating weakness from cancer treatment. And I realize how fragile it all is. How the call from my doctor could have gone much differently. How my relief could have been sorrow, pain or fear. A stress fracture and crutches is an inconvenience. I remind myself there is much to be grateful for. Make room for both anger and acceptance. Joy and sadness. Life is a wild ride… Embrace it one day at a time. With gratitude and love. My new look… for 4-6 weeks. Smile not always included. Katie finds joy and light even in the darkest moments. 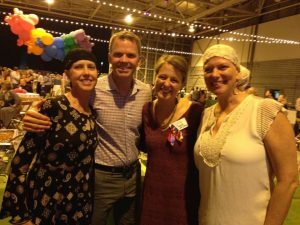 As she faces metastatic breast cancer – she is an example to us all of how to live in joy.